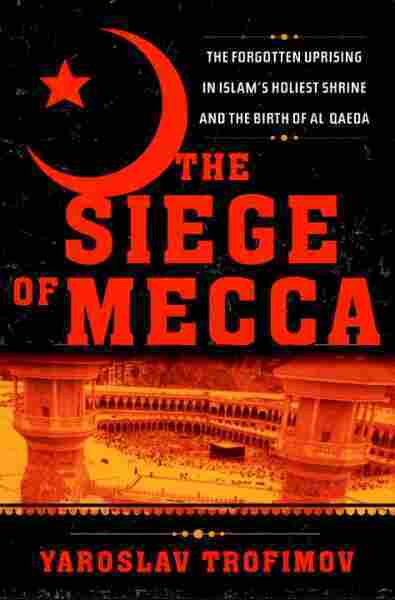 The Siege of Mecca NPR coverage of The Siege of Mecca: The Forgotten Uprising in Islam's Holiest Shrine and the Birth of Al Qaeda by Yaroslav Trofimov. News, author interviews, critics' picks and more. Describes the bloody 1979 takeover of Islam's holiest shrine, the Grand Mosque in Mecca, by hundreds of armed gunmen led by Saudi preacher Juhayman al Uteybi, who believed the Saudi royal family had become a servant of American infidels; the assault that knocked out the insurgents; and the repercussions of the event in terms of the rise of violent, extremist Islam around the world. 75,000 first printing. Did 'Siege of Mecca' Give Birth to Al-Qaida? September 22, 2007  In November 1979, gunmen in Mecca seized Islam's holiest shrine to proclaim the arrival of the Muslim messiah. It took Saudi forces, aided by French commandos, two weeks to flush the rebels out of Mecca. The holy city of Mecca looked deceptively calm as the first dawn of the new century started to break behind craggy mountains. Splashing his face with cold water, the Grand Mosque’s bearded imam fastened a beige-hued cloak over his shoulders and muttered praises to the Lord. The time to lead the morning’s first prayer was minutes away. Under his window, the mosque’s floodlit courtyard was filling up quickly. The hajj pilgrimage season, when this stadium-size enclosure was traversed by more than a million worshippers, had already ended. Yet Mecca remained jam-packed with the faithful. Many of them had spent the night inside Islam’s holiest shrine, curling up on wool carpets in the Grand Mosque’s multistory labyrinth of nearly a thousand rooms. As usual, these worshippers camped along with their bundles, mattresses, and suitcases that nobody had bothered to check. Following custom, many hauled in wooden coffins, hoping that the imam would bestow on decomposing relatives inside the precious blessings that can only be received in such a sacred precinct. Today, some of these coffins contained an unusual cargo: Kalashnikov assault rifles, Belgian-made FN-FAL guns, bullet belts, and an assortment of pistols. The men who had smuggled this arsenal into the mosque sought an ambitious goal: to reverse the flow of world history, sparking a global war that would finally lead to Islam’s total victory and to a destruction of arrogant Christians and Jews. The date was the First of Muharram of Islam’s year 1400–which in calendars kept by infidel Westerners corresponded to November 20, 1979. For the natives of Mecca, a city that lives off the flood of humanity that has coursed through its shrines since time immemorial, this Tuesday morning promised a particularly joyful occasion: New Year’s day is when, according to tradition, the Meccans make a pilgrimage of their own to the Grand Mosque. In darkness, thousands trekked to the outskirts of the city, shedding everyday clothes after a shower and returning in the pilgrims’ snow white ihram outfits–two towel-like garments that symbolize purity and leave men’s right shoulders exposed. Hidden in this human sea were hundreds of grim-faced rebels, many of them sporting red checkered headdresses. Some had been inside the mosque for days, reconnoitering its maze of corridors and passageways. Others were bused in during the night by a friendly religious academy. Yet others drove their own cars to Mecca this morning, arriving at the last minute and accompanied by children and wives to allay guards’ suspicions. Most of these conspirators were Saudis of Bedouin stock, though their ranks also brimmed with foreigners, if such a word had a meaning for men who believed in the single citizenship of Islam. They even included African American converts, inspired by a new faith and hardened by race riots half a world away. that looms in the center of the enclosure. Rumors quickly swirled through the crowd. What could all this be? What was all that noise? Maybe there is an innocuous explanation, one man opined. Maybe the gunmen were bodyguards for some senior prince, or even the Saudi monarch, King Khaled, himself ? Maybe the gunfire was just some peculiar Saudi way to celebrate the New Year? More knowledgeable worshippers shuddered. Firing a weapon in the Grand Mosque, they knew, was a grave sin. They couldn’t recall the last time such a sacrilege had occurred. Pilgrims watched with angst as more and more gunmen closed in on the Kaaba, carrying weapons that had been extracted from uncrated coffins. The Grand Mosque’s own police force, armed with nothing more threatening than sticks for beating misbehaving foreign pilgrims, melted away once two guards who attempted resistance fell dead by the gates. Amid this commotion, the rebels’ leader, Juhayman al Uteybi, emerged from the depths of the mosque. A forty-three-year-old Bedouin preacher with magnetic black eyes, sensual lips, and shoulder-length hair that seamlessly blended into a black curly beard, Juhayman conveyed a sense of immediate authority despite his slender stature. Emulating a piety first displayed by Prophet Mohammed himself, he wore a traditional Saudi white robe that was cut short at midcalf to signal the rejection of material goods. Unlike his fellow gunmen, he was bareheaded, with only a thin green hair band keeping his unruly locks in check. Flanked by three militants armed with rifles, pistols, and daggers, Juhayman started to elbow his way across the courtyard, toward the sacred Kaaba and the Grand Mosque’s imam. The cleric, who had just turned his face away from the Kaaba and toward the distressing tumult among the believers, noticed that he was standing right next to a coffin. This one contained a real cadaver; the dead child’s relatives, oblivious to the mounting upheaval, were imploring the imam to bless the tiny corpse. As the cleric obliged, reciting the sacred lines, recognition flickered on his face. He realized in these moments that Juhayman and some of the other gunmen, who now got disconcertingly close, had attended his lectures on Islam here in Mecca. This feeling turned to horror seconds later, as Juhayman unceremoniously pushed the cleric aside and seized the microphone. When the imam tried to wrestle back the mike, one of the intruders raised a sharp curved dagger and screamed at the top of his lungs, ready to stab. A fright swept the crowd. Picking up shoes, thousands rushed toward the enclosure’s gates, only to find all fifty-one of them chained shut. Ragged-looking gun- men, muzzles staring into the crowd, barred all exits. Unsure of how to behave, some worshippers started chanting “Allahu Akbar”–“God is Greatest”–the Muslims’ invocation of faith in a moment of adversity. The gunmen unexpectedly joined in this chorus and it became louder and louder, spreading throughout the packed mosque until it turned into a deafening roar. gates. The fittest were forced at gunpoint to climb the steep staircases to the tops of the minarets, carrying water and crates of ammunition. The takeover of Islam’s holy of holies was swift and complete. Under the minarets, even Saudis–proficient in the local dialect–had a hard time understanding what was going on. The crying of women, the coughing of elders, and the shuffling of bare feet filled the Grand Mosque’s courtyard with an anxious hum. Many foreigners among the tens of thousands of hostages spoke no Arabic at all and stood transfixed in the turmoil, asking better-educated countrymen for explanation in a multitude of tongues. The conspirators were prepared for linguistic problems, and wanted to be comprehended. Soon they grouped Pakistani and Indian pilgrims on one side of the mosque, with a Pakistani-born rebel interpreting the announcements in Urdu to bewildered compatriots. A cluster of Africans was provided with a speaker of English. “Sit down, sit down and listen,” Juhayman’s gunmen yelled, rifle-butting those pilgrims who dared to disobey. As cowed worshippers finally settled in fearful attention, the mysterious group indicated that its authority now extended well beyond the Grand Mosque to Saudi Arabia’s commercial capital and to the second of the country’s two holy cities. “Mecca, Medina, and Jeddah are now in our hands,” the rebels declared through the shrine’s public-address system, so powerful that their words could be heard throughout central Mecca. Then Juhayman handed the microphone to an aide better versed in classical Arabic speech. It was high time to explain the purpose of this daring venture. For the next hour, the Grand Mosque’s loudspeakers relayed the uprising’s shocking message to the world’s one billion Muslims, announcing that an ancient prophecy had been fulfilled at last and that the hour of final reckoning was being struck. By the time this speech, occasionally interspersed with gunshots, was over and the loudspeakers fell silent, panic infected the whole of central Mecca. Even waiters at the outdoor cafés near the mosque had all run away. Thus began a drawn-out battle that would drench Mecca in blood, marking a watershed moment for the Islamic world and the West. Within hours, this outrage would prompt a global diplomatic crisis, spreading death and destruction thousands of miles away. American pilots and European commandos would all have to be involved in restoring the shrines of Islam to the House of Saud. Soon, American lives would be lost, and America would find itself more isolated than ever in the increasingly hostile Muslim universe. The consequences of this forgotten crisis–which remains blotted out of history books in Saudi Arabia and many other Muslim lands–last to this day. In tackling Juhayman’s brazen attack on its holiest shrine, the Saudi government showed sickening arrogance, cruel incompetence, and bewildering disregard for the truth. The royal family’s image was sullied forever. Many Muslims in Saudi Arabia and beyond, including the young Osama Bin Laden, were so repulsed by the carnage in Mecca that their loyalty started to fracture. In following years, they drifted toward open opposition to the House of Saud and its American backers. The fiery ideology that inspired Juhayman’s men to murder and mayhem in Islam’s holy of holies mutated with time into increasingly more vicious strains, culminating in al Qaeda’s death cult. By a coincidence of global events, it is precisely this ideology that American policy makers–and the House of Saud–found right after the crisis in Mecca to be of great value on the Cold War battlefronts. Instead of being suppressed, Juhayman’s brutal brand of Islam was encouraged and nurtured as it metastasized across the planet since 1979. Today, hordes of his spiritual heirs are busy blowing up airplanes, tourist hotels, and commuter trains on four continents, self-satisfied smiles of true believers curling their lips. The significance of the Mecca uprising was missed at the time even by the most sharp-eyed observers. Too many other threats preoccupied the West. The seizure of the Grand Mosque–the first large-scale operation by an international jihadi movement in modern times–was shrugged off as a local incident, an anachronistic throwback to Arabia’s Bedouin past. But with the benefit of hindsight, it is painfully clear: the countdown to September 11, to the terrorist bombings in London and Madrid, and to the grisly Islamist violence ravaging Afghanistan and Iraq all began on that warm November morning, in the shade of the Kaaba.